Since 1968, the Gerald Desmond Bridge has been a vital part of U.S. infrastructure, serving as a major trade corridor that carries 15 percent of all containerized cargo imported to the United States through the Port of Long Beach, Calif. The bridge is also a critical access route for commuters, connecting Terminal Island (the heart of the port complex) to Long Beach Freeway and downtown Long Beach. Now that the 47-year-old bridge has reached its end of life, the Port of Long Beach and Caltrans has commissioned a replacement structure that will not only accommodate the larger sizes of modern cargo ships, but also improve traffic flow and increase safety. Construction began on the new bridge in 2013. When complete, it will be the first cable-stayed bridge in California—and the tallest of its kind. 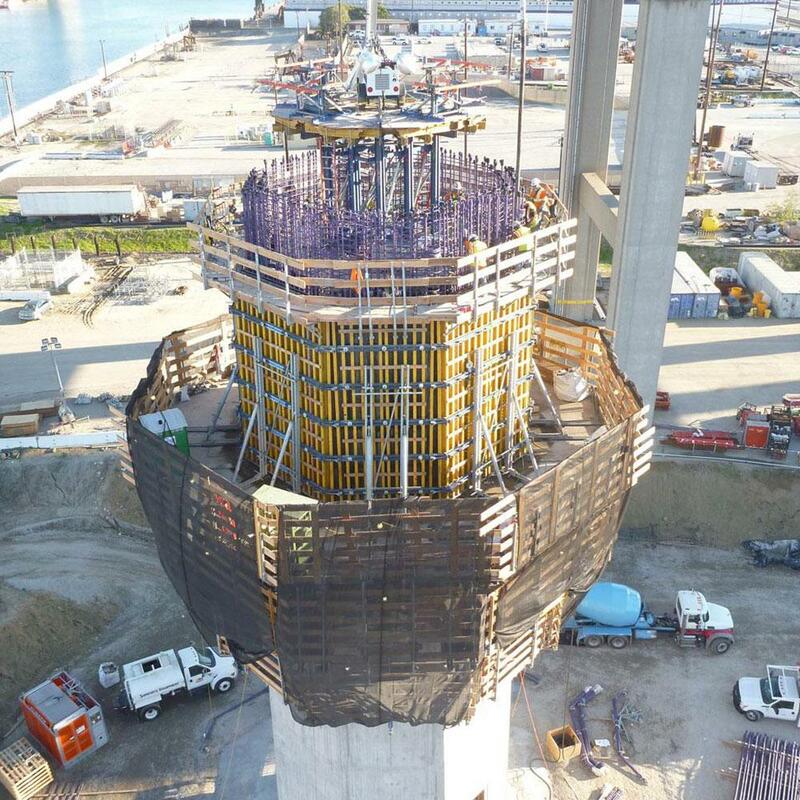 The bridge’s two 516-foot-tall concrete towers, or pylons, will be seen for miles, with cables extending from them to connect to the bridge deck and support its 2,000-foot-long span. The challenge: The challenge in constructing the double pylon masts lies in their octagonal design, which tapers as it rises in height. In early 2015, Doka joined the construction team to supply a constant-changing formwork solution that can achieve the narrowing silhouette. The solution: To execute the change in shape with each casting section, or jump, Doka is providing 2,500 square feet of Top 50 formwork. The modular gang-form system can be assembled in any configuration to adapt to any shape, plus it’s easily retracted for cleaning and jump sequences. The formwork can also be used to meet stringent specifications for surface finishes, which was the case for this project. 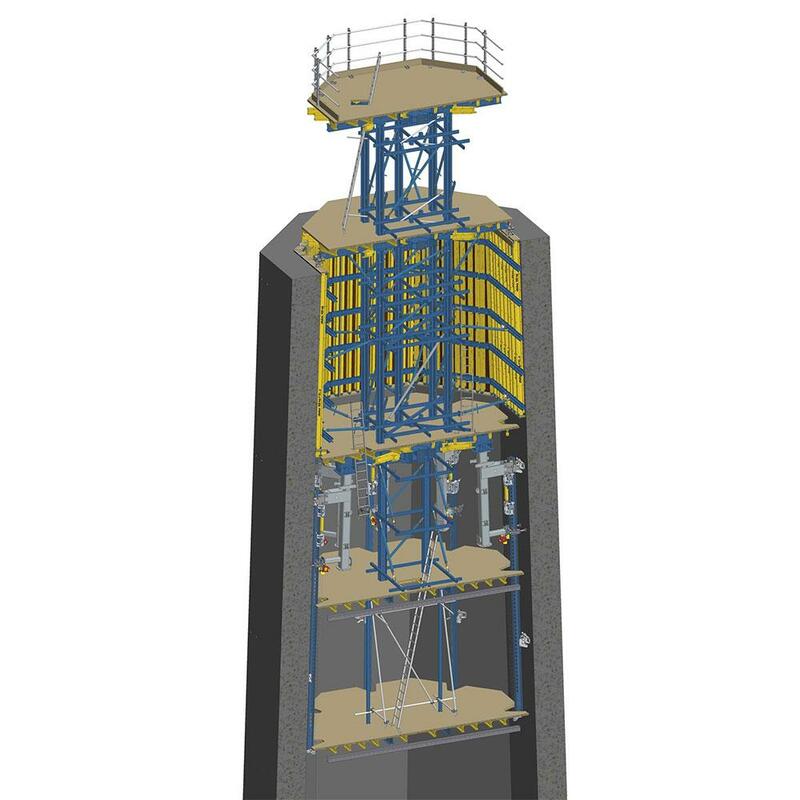 Doka’s SKE automatic climbing platforms also are being used inside and outside of the pylons to jump the Top 50 formwork system in 31 casting steps. Each casting step is 18 feet high. The SKE climbing brackets enable easy hydraulic climbing, without the need for cranes. 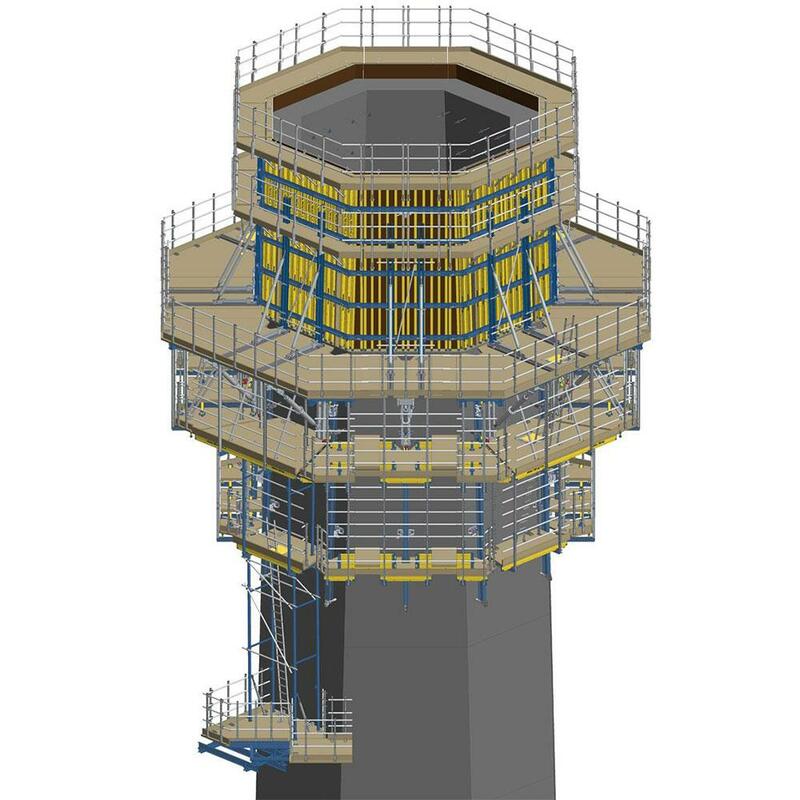 Communication, pre-assembly saves time on the jobsite To organize the scope of work and keep the project moving, Doka met weekly with the pylons design team during pylon design, layout and fabrication stages. As part of this process, Doka delivered fabrication drawings to vendors, procured needed materials and equipment, sent the drawing log to the general contractor and addressed any formwork pre-assembly issues with the carpenter crew. Individual formwork parts were pre-assembled by the Doka team to ensure tight form joints and a best-in-class joint pattern, even with the challenging geometry of the pylons. The pre-assembly team also ensured all custom components (i.e., splices and walers) connected to each other correctly via preconstruction mock-ups—so potential problems were resolved before the equipment reached the jobsite. The mock-ups were especially important because of the high number of custom components required for the unique formwork/climbing platform configuration. Both Doka and the pylon design team provided field services upon delivery of formwork parts, and Doka continues to provide customer service. The new cable-stayed bridge continues to take shape. The base (pile cap) alone for each pylon is two stories high. Rising more than 200 feet above the water, the bridge will allow the newest generation of cargo ships to pass beneath. To increase safety and traffic flow, it will also include six traffic lanes, four emergency shoulders and separate bicycle and pedestrian paths with scenic overlooks. Thank you for your interest - Gerald Desmond Bridge Replacement Project. Thank you very much for your interest - Gerald Desmond Bridge Replacement Project.